Scroll down to read these articles. The pleasantly calm and very focused woman at the knife sharpening table each Saturday in the Chelsea Market, 75 9th [15th] is Margery Cohen. She maintains equilibrium while in constant motion -- examining the knives that come in to determine their condition, smoothing blades over her diamond stone, hand chiseling the teeth of a serrated knife, answering many questions from passersby and returning precisely wrapped and packaged knives to their owners. Ms. Cohen learned the value of a properly sharpened knife when she was working in the fish business and then as a part owner of a restaurant in Berkely, California. Now her once-weekly stand is visited by a vaiety of people looking for a keener blade -- men with pocket knives, home cooks and restaurant chefs are all piling up knives on her table. Ms. Cohen uses a diamond stone onto which she drips water for a smoother motion and less abrasion on your knife. She uses a Japanese technique which she learned from a woodworker. "It's more a circular motion on the stone than back and forth, tiny movements all the way down the side of the knife." Besides knives, she sharpens scissors and tools and has even worked on a set of darts that someone brought in. A variety of chisels, files and other stones are used for more recherche items. 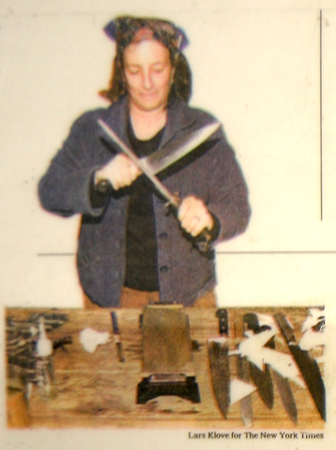 Samurai Sharpening Service opens at noon on Saturdays and Ms. Cohen hones until 6pm. Sometimes knives can be sharpened while you wait, but if the day is a busy one you might have to leave them for an hour or so while you shop or lunch. If she's very busy, she may have to keep your knives until the following Saturday. Prices for sharpening start at $2 for a small paring knife and go up to about $4 for an 8" chef's knife, depending on the condition of the knife. Margery Cohen, left, looks even less like a samurai than Tom Cruise does. But on Wednesdays and Saturdays from noon to 6 p.m. at the Samurai Sharpening Service, in front of Bowery Kitchen Supplies at Chelsea Market, 75 Ninth Avenue (15th Street), she can tackle your dullest kitchen and garden tools. Ms. Cohen, who worked in the fish business in New Jersey and San Francisco (she wanted a job that required no dressing up), took over the business from a Japanese-American woodworker who taught her to sharpen, then left for Hawaii. She does not grind the blades with a wheel which can wear them down, but by hand with a diamond stone charging $2 to $5 a blade, depending on size. She will make house calls, $150 minimum, so you might want to gather firends. She can be reached at (212) 942-5228 or margery@ix.net.com. NY1’s new home at Chelsea Market features an eclectic mix of wholesalers and culinary specialists. In the following story, NY1 Home Reporter Jill Scott tells us about one market member who's a cut above the rest in her trade. It’s a trade not commonly found anymore. Many New Yorkers can remember the days when it was common for a knife sharpener to come knocking on your door, but now those seeking an edge in the kitchen can just visit the Chelsea Market. Every Saturday Cohen sets up shop in the market and gives customers a chance to clean up their kitchen tools. But in addition to those bringing in knives, she has plenty of onlookers who are fascinated by her skill. That's because she doesn't rely on cutting edge technology - she does it the old fashioned way. Then she flips it over and does the other side. She then finishes it off by moving the knife only in one direction. But there's still one more step. Cohen has had extensive training. She first realized this was her calling after working at a fish market, and she was then trained by a woodworker who taught her how to sharpen tools. As for her customers, many say they are thrilled to have found this service. To have a knife sharpened can cost anywhere from $$2 to $$5, depending on the size, and it can usually be done in a couple of hours. And Cohen says during her Saturdays at Chelsea Market there's never a dull moment. If you are interested in getting something sharpened, you can visit Samuari on Saturdays from noon to 6 p.m. So pack up your knives and scissors and let Cohen get straight to the point.